When it comes to protecting the climate, we often find ourselves playing defense against massive fossil fuel development proposals that threaten our communities and environment. In the Pacific Northwest, we have experienced an onslaught of fossil fuel export proposals over the past 10 years. Thankfully, due to the tireless advocacy of conservation groups and community members throughout the region, most of those proposals have been defeated or significantly delayed. While the reactive approach to stopping fossil fuel developments has proven effective, communities are shifting towards proactive strategies for combating climate change. 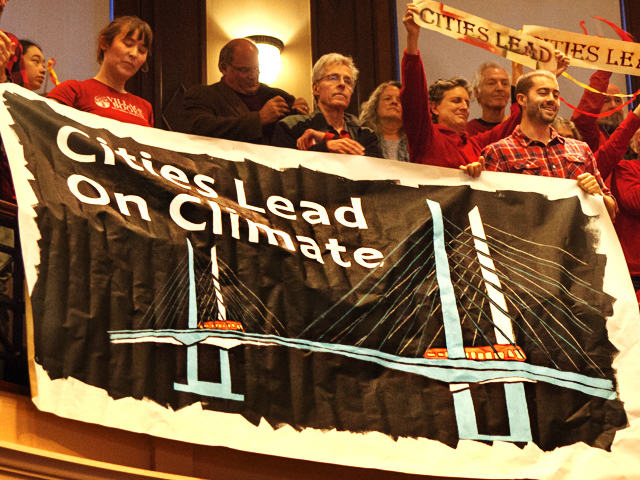 In December 2016, the City of Portland took a major step forward by adopting citywide restrictions on bulk fossil fuel infrastructure. The City amended its zoning code to restrict new fossil fuel storage facilities greater than 2 million gallons and prohibit expansion of existing facilities. The restrictions were adopted, in part, as a response to a proposed propane terminal along the Columbia River in Portland that was vigorously opposed by conservation organizations and community groups. The zoning amendments were the first of their kind in the nation and marked a win for climate advocates. Shortly after the City adopted the zoning amendments, the fossil fuel industry challenged the law before the Oregon Land Use Board of Appeals (the board). They contended that the restrictions discriminated against and burdened interstate commerce in violation of the Constitution. Crag stepped up to represent Columbia Riverkeeper, Center for Sustainable Economy, Audubon Society of Portland, and Oregon Physicians for Social Responsibility to defend the law. Although the board sided with the industry opponents, Crag challenged that decision before the Oregon Court of Appeals and won. The appeals court held that the restrictions were constitutional and reversed the board. The Court of Appeals ruled that restrictions on the size and location of fossil fuel developments were “an exercise of local authority over a particularly local concern[. ]” The Court noted the City of Portland’s legitimate interests in limiting fossil fuel infrastructure in high-risk earthquake liquefaction zones, reducing the risk of fires, explosions and train derailments, and protecting public health from fossil fuel related pollution. Crag and our clients are encouraged by the Court’s rejection of the fossil fuel industry’s effort to defeat local action to protect our climate and communities from the dangers of fossil fuels. Right now, it is up to local communities to stand up for our future and to push back against the fossil fuel industry. This case demonstrates that local authority over land use and zoning can be a powerful tool for communities and local governments that want to be leaders on the climate. The Court’s decision and Portland’s zoning amendments will hopefully provide guidance to other communities looking to adopt similar proactive measures. Several Northwest communities have already begun analyzing and adopting similar restrictions, including Vancouver, Tacoma, and Seattle, WA and Whatcom County, WA. *The fossil fuel industry opponents are seeking review of the Court of Appeals decision at the Oregon Supreme Court. We are awaiting a decision from the Supreme Court as to whether it will accept the case for review. Stay up to date at our website www.crag.org.